Goodreads says, "Brilliantly weaving impeccable historical research with stirring storytelling, Edward Rutherfurd explores our shared Celtic roots in a magnificent epic of Ireland spanning eleven centuries. 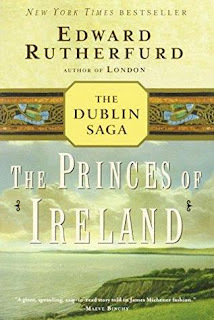 While vividly conveying the passions and struggles that shaped particularly the character of Dublin, Rutherfurd portrays the major events in Irish history: the tribal culture of pagan Ireland; the mission of Saint Patrick; the coming of the Vikings; the making of treasures like the Book of Kells; and the tricks of Henry II, which gave England its first foothold in medieval Ireland. Through the interlocking stories of a memorable cast of characters–druids and chieftains, monks and smugglers, noblewomen and farmwives, laborers and orphans, rebels and cowards–Rutherfurd captures the essence of a place and its people in a thrilling story steeped in the tragedy and glory that are Ireland." Rutherford takes us through Irish history starting with when the Irish were pagans. The year was 430 AD and we meet Deirdre and her father, Fergus, who is currently the Chieftain. Things aren't simple for Deirdre though as she is in love with someone whom she isn't betrothed to. Disaster ensues and as the years pass we watch the Irish people take on various transformations with one being the start of Christianity and the arrival of St. Patrick. Then there's the Vikings arrival, the Tudor conquest, and so much more in between. All the while there are betrayals, romance, battles, rebellions, and religious issues. Rutherfurd presents some of the information in The Princes of Ireland as a history lesson, but for the most part, facts are weaved with story and in turn it makes for a compelling tale. Rutherford showcases Irish families throughout history in The Princes of Ireland and just as readers are starting to get invested in a particular character, the years go by and we move on to new ones. I would say that I found myself more interested in certain time periods than others as I find the time of Brian Boru most interesting. In fact, some sections of the novel were truly captivating while others sort of dragged on. I guess that is expected when a novel is 700+ pages. However, there was a lot that I loved about The Princes of Ireland. I really enjoyed learning more about Brian Boru and his interactions with the Vikings. I also thoroughly enjoyed learning more about the different clans, such as the O'Neills, O'Briens, and the O'Connors as well as their mark on Irish history. I also thought it as very compelling how Rutherfurd took readers through how the Vikings terrorized Ireland for years and their influence on the island as well as the unrest amongst the various Irish clans. The novel covers famous Book of Kells, the High King of Tara, Council of Cashel and so much more. This would be an excellent read to delve into before a trip to visit Ireland or fans of the show Vikings as there are many similarities. If you love Irish history and historical fiction, definitely give The Princes of Ireland a try. Although it was slow in a few parts, I did learn a lot and it sure beats reading a textbook on the topic. I look forward to checking out book two of The Dublin Saga and learning even more about Irish history.